Colin Quinn in Colin Quinn: Red State Blue State. Photo by Monique Carboni. BOTTOM LINE: The actor-comedian is back to take on the Nancy Pelosi lovers, the gun-toting conservatives and everyone in between in his latest show tackling politics, free speech, and other hot-button issues. He seems most disappointed about free speech, wishing everyone would just shut up once in a while. “For a free speech country, I haven’t heard that many great speeches…the Martin Luther King speech, the John F. Kennedy speech and the end-of-season monologues from The Bachelor.” In Quinn’s mind, social media has led to mob rule, leading to an amusing comparison between the arguing of the old days (at the local bar) vs. the Facebook-Twitter-Reddit firestorms of today. I wouldn’t say I agree with a lot of Quinn’s positions, but he’s intelligent, thought-provoking, funny, and he doesn't play favorites. Although the ending, in which he names every state and gives an example of how each one is uniquely terrible, is largely uninspired and not all that witty (even if I laughed at the one for New Jersey). One might wonder how many people in the audience will agree with Quinn on what’s wrong with America. But I don’t think that’s really the point. The purpose here seems to be to prompt people to think beyond sound bites and click bait, and to contemplate how we might course correct the path we’re on. And hey, these 50 states aren’t totally doomed. Quinn rhapsodizes about our towels (way better than Europe's) and our abundance of ice cubes. “Go out for drinks and you get six ice cubes. That’s the system we set up. The Prime Minister of England asks for ice and she gets one ice cube.” So America, there may be hope for you yet. 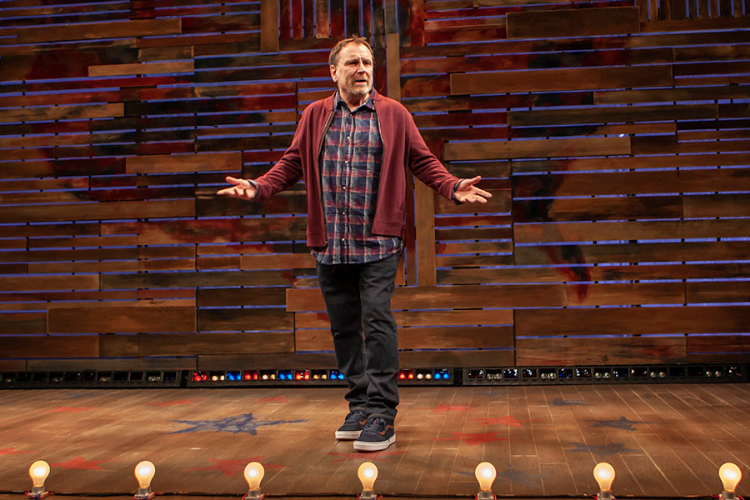 Colin Quinn: Red State Blue State is written and performed by Colin Quinn. Directed by Bobby Moresco. Set Design by Edward T. Morris. Lighting Design by Aaron Copp. Sound Design by Sam Kusnetz. Stage Manager is Mary Cate Mangum.